Lush Local Flora Enchants Plant City Hotel's GuestsSituated just outside of Tampa, the Holiday Inn Express Plant City hotel's accommodations offer an idyllic getaway apart from the city and yet convenient to its many attractions. Surrounded by verdant tropical foliage, this hotel's property in Plant City, Florida sets a relaxing tone for vacations and business trips alike.Professionals find ample opportunities here in Plant City, Florida. 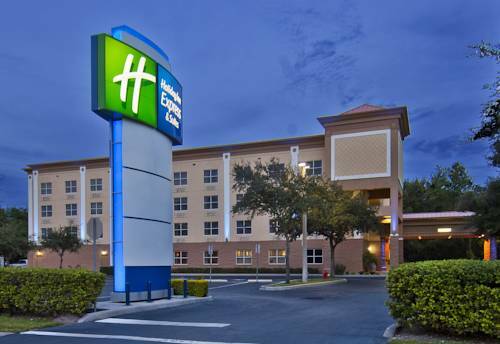 The hotel's proximity to Tampa puts guests within minutes of metro area businesses. Nearby I-4 ensures easy transportation to corporate destinations in greater Tampa, as well, including the thriving commercial manufacturing industry in Plant City.The hotel's leisure guests enjoy endless entertainment resources in Plant City. Local sports complexes and yearly events like the Florida Strawberry Festival and Sun n Fun Air Show draw big crowds, as does Dinosaur World, a park that transports guests back to a time when dinosaurs roamed Earth. Our guests enjoy fantastic amenities. A free, hot breakfast buffet each morning gets you geared up for the day, and the beautiful outdoor pool offers a place to relax once work is done. The 24 hour Fitness and Business centers accommodate any schedule, and free wired and wireless high speed Internet access keep you connected throughout your stay. Come discover how to "Stay Smart" in Plant City! American Style Restaurant. Within close walking distance next door to hotel. Open 24 hours per day. Newly Renovated. America's Favorite Steakhouse. Restaurant is located 3 miles West of the hotel. Outback has a wide variety of meals along with full loquor bar. Italian Grill Restaurant. Restaurant located 3 miles West of the hotel. Restaurant is full service and also has a full bar. Full Service Southern Buffet and Restaurant. Locally owned and operated. Locally owned restaurant with a wide variety of seafood and BBQ. Citrus Meeting Room is 625 sq/ft meeting facility. Meeting room is adjacent to hotel lobby and public restrooms. Meeting room includes full wireless internet access, pull down projection screen, dry erase boards and 52" LCD monitor. Catering options. Berry Meeting Room is 180 sq/ft meeting facility. Meeting room is adjacent to hotel lobby and public restrooms. Meeting room includes full wireless internet access, built in dry erase board. Catering options. Florida Mall includes: Publix, Beall's Department Store, GNC, Kazboors Restaurant, CVS Pharmacy, Strong Vision Center, Moe's Restaurant, Heartland Dental Center and Goodyear Tire Center. Two challenging 18 hole championship courses designed by Internationally known golf course designer Ron Garl. Both courses are cut through the natural beauty of the Walden Lake Community in Plant City. Driving Range, Putting, Chipping on site. Named the number one zoo in the entire USA. Tampa's Lowry Park Zoo has over 2000 animals in natural habitats including the Florida Manatee. Daily shows, rides and animal exhibits. Fantasy of Flight features the world's greatest aircraft collection. Fighter planes, airplane restoration and aircraft history. Includes static displays, flight simulators and hot air balloon and biplane rides. Enjoy all of the famous Disney Theme Parks: Magic Kingdom, Epcot, Hollywood Studios, Animal Kingdom. They also have two Water Parks Blizzard Beach and Typhoon Lagoon. Universal Studios. Where Vacation Becomes Adventure. Jump into the action of your favorite movies and TV shows with rides and attractions for all ages. Busch Gardens is Tampa's Largest Theme Park. Taking you into the World of the Safari. It is packed with some of the largest Thrill Rides in the Country, Shows, Animal Attractions and Up Close Adventures. The Randy Larson Fourplex is a top rated sports complex with multiple fields for both Baseball and Softball. Under the Plant City Parks and Recreation Department, the tournament schedules can be found on their website. ~22 miles from Plant City. ~37 miles from Plant City. ~43 miles from Plant City. ~44 miles from Plant City.